NetBet Poker Review for 2019 - With a Bonus up to €/£/$1,000! Join now and double your money up to £1,000! NetBet Poker is GLI accredited and independently audited. Visit NetBet Poker Get Your Bonus! NetBet Poker is one of our top-rated online poker rooms. It is fully licensed and regulated. It is regulated by the UK Gambling Commission. Fast, flexible, and secure withdrawals in just one day with majority of deposits approved instantly. ? All legitimate, real-money poker sites like NetBet Poker have strict anti-fraud screens, and that may create a short withdrawal delay. Accepts a wide selection of payment methods including VISA credit cards. 200% first deposit bonus up to a value of £1,000. NetBet Casino gives new players from CardsChat the chance to earn a £15 cash bonus with their first deposits. NetBet Casino is a Playtech-powered online poker room that has been in operation since it re-branded from its former name of Poker770 back in 2014. It is one of the veteran names in the online poker market and is available for players to enjoy in both a downloadable version and via instant play. It has thrived across the European market due to offering its game play in a variety of different languages. Its location in Malta has allowed it to remain a major power in the online poker industry within Europe. The poker site has held a European gaming licence from the jurisdiction of Malta since 2006. The poker room is registered in Malta in this current day and is regulated by the UK Gambling Commission. The electronic payment software used by NetBet Poker is Websecurity Transactions to ensure that all payments and financial transactions on the website are totally safe and secure. The tables available to play at the poker site also use a random number generator for dealing the cards to guarantee that fair gaming is carried out at all times and to the standards of fairness and player protection held by the UK Gambling Commission. 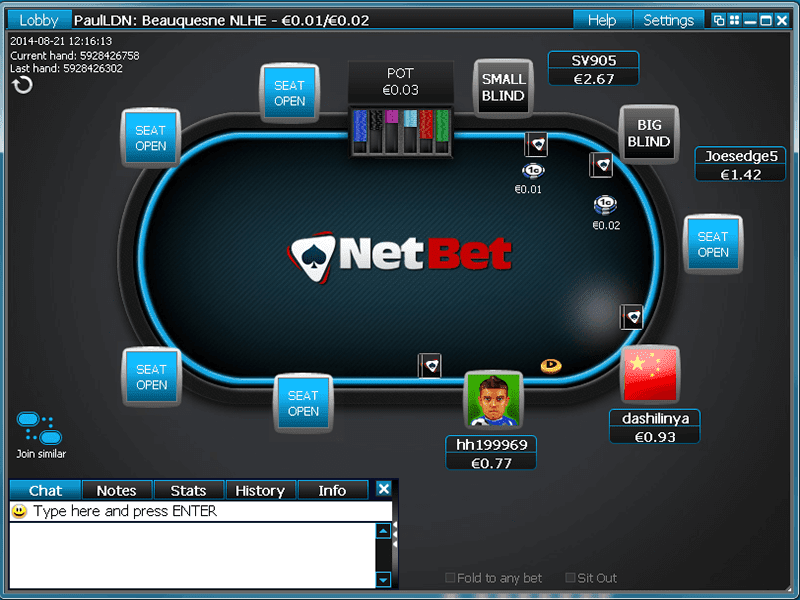 NetBet Poker also works with an independent adjudicator called The Independent Betting Adjudication Service (IBAS) that intervenes and acts as an impartial mediator in all disputes between the online poker room and players. The poker room offers several sub-sections divided into its introduction, promotions, tournaments, VIP, Academy, casino games, help, download, and chat sections. These are all clearly displayed across the top of the home page so you are always within a single click of the different sections of the poker site. Players can also choose what language they wish to navigate the poker in and there are also social media options so players can easily follow and join social media groups managed by NetBet Poker on social media sites such as Facebook, Twitter, and Google Plus. The main focus at NetBet Poker is the wide selection of different games available. Over £5 million in Guaranteed Prizepools are available for players to compete for every month. Progressive jackpots can also be triggered in the Jackpot Sit 'n' Go tournaments through the iPoker Network that NetBet Poker belongs to. The weekly Sunday Line-Up tournaments also offer at least £200,000 guaranteed in prizes. All versions of Texas Hold'em, Omaha, and Stud Poker are available to play at NetBet Poker. These come in the form of a range of single table and multi-table games as well as sit 'n' go tables and tournaments. The most attention from players at NetBet Poker is focused on the No Limit Texas Hold'em cash games. You will rarely find a table that is not packed with players trying to earn some quick hard cash at the tables. 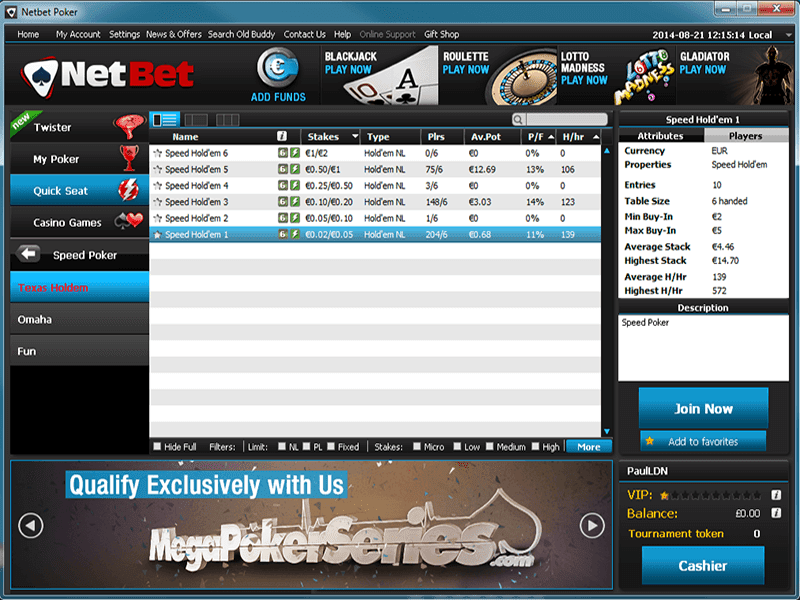 Another real draw to NetBet Poker is the wide variety of freeroll tournaments that are organised. These gives players the chance to win prizes without having to pay an entry fee and can prove very popular as players also use them as a chance to practice for free. NetBet Poker also offers a range of casino games for its players to enjoy. A variety of Playtech-developed slots, craps, roulette, blackjack, sic bo, and video poker games plus many more classic table games are available to play. Unfortunately, NetBet Poker uses flash technology to run its software which means that any iPad, iPhone, Windows, or Android smartphone device that does not support flash will be unable to run the software on the mobile device. Players can still access the poker site through their mobile phone but there is no app available and no downloadable apps that run the software on mobile devices. It will still be possible to access the site, register, and make a real cash deposit but real money poker gaming will not be available if your device does not have the latest version of HTML5/ Ajax technology. There are a number of bonus offers and promotions that can be activated when playing at NetBet Poker. New players can take advantage of a welcome bonus that offers a 200% first deposit bonus up to £1,000. There is also the chance to earn £15 in real cash when players use the promotional bonus code of FREE20 when they make their first deposit after they have registered a new account at NetBet Poker. Those players that refer-a-friend to NetBet Poker will be rewarded with a £50 bonus. On top of this, every friend that they refer will also be given a £20 bonus as part of this promotional offer. This will be on top of the other welcome bonuses. NetBet Poker offers 24/7 customer service support and that means that players can access help with their queries through a number of methods including live chat, telephone, email, and fax. There is also an FAQ section available for players to browse. The poker site states that it will aim to respond to all queries within 30 minutes and that is 24 hours a day, 7 days a week. The poker room offers a wide range of deposit and withdrawal payment methods. The deposit methods include VISA, Skrill, iDeal, Sofort, Giropay, Online Bank Transfer, Neteller, Bitcoin by Neteller, Ukash, Paysafecard, Ecard, Euteller, Trustly, Web Money, Qiwi, and Moneta. These are a bit more varied than you might find at some online poker sites which is good news for those players that use the less renowned methods of payment for their online poker activity. The withdrawal methods are not quite as versatile and they consist of VISA, Skrill, Neteller, Bank Transfer, Web Money, Qiwi, Moneta, and i-Banq. A few of these methods are not readily available at other online poker sites which is great to see but they could offer more methods of withdrawal when you consider how many methods for depositing funds they offer. 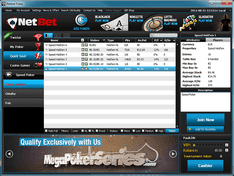 NetBet Poker is a war horse of an online poker site having been around for a while and having lived through the constant changing world of online poker gaming. Considering it was first set up over a decade ago it has evolved incredibly well on the visual front and it has adapted to the requirements of the modern player. The mobile platform is easy-to-use and very in-depth but there is also room for improvement. The selection of games available to play is very impressive. Not only does it offer a wide selection of poker games and tournaments but the inclusion of the casino games tab gives players the chance to try some classic casino table games whilst they are on the site. The movement towards including casino games on poker sites has been a controversial one, particularly with professional online poker players, but it is one that sites like NetBet Poker have embraced. It is one of the most well-known online poker sites on the market and you can see why. The progressive jackpots that can be accessed through the iPoker Network give this site a unique selling point compared to other larger sites. The freerolls are also some of the best around and that can be a major drawing point for a lot of players. Join NetBet Poker Today and double your deposit up to £1,000!